This book is an anthology of women’s experiences in Canada during World War II. The anthology is a collection of first-person narratives from 57 women who served in various branches of the armed forces, auxiliaries, private industry in Canada during World War II. Each of the narratives have similar chronologies and approach – what the women were doing before the war, how they joined the Armed Forces or supporting occupation, their experiences during the war (both personal and professional), their life-in-brief after the war, and, finally, a chance for them to pass some judgement on “what did it all mean” for them or for women in general. Although I know the editor, and hence added the book to my reading list for that reason, the stories and subject matter are compelling to me in their own right. I can remember reading an USA Today article back in 2001 about the efforts of some U.S. organizations to capture oral histories of their WWI and II survivors, archiving them at the Library of Congress and elsewhere. Volunteer organizations set up sample questionnaires and encouraged young Americans to interview their grandparents about their experiences in the war, recording them and sending them off to be archived. Distributed processing of oral histories is a great technique that works with limited resources, and I remember getting excited about it, wondering what we were doing for Canadian histories? As it turns out, quite a bit. The Department of Veterans Affairs has a website that captures a lot of this for Canada and has some great materials available to all online. This book though captures the often-missed histories of women during that time. The individual stories are compelling and varied in place of origin, type of occupation, impact, and all the elements that comprise the story of each woman, presented in their own words. It is an amazing collective resource for anyone doing research on the era, and would serve as both a stand-alone text as well as a supplement to the experiences of others (mostly men) during the Second World War that are covered elsewhere. And it includes all the things people would expect, which I won’t cover in detail, as well as some surprising elements that transcend the ordinary. the two government employees explaining to them in 1941 that there were going to be new deductions from their wages for something called “income tax” and “unemployment insurance” (Olive Villeneuve, p.168). My favourite though is the impact of reading Lorna Stanger (p.161) talking about VE-Day in Europe. For the first time since the war started, they could have the lights in the city on at night, and had it all lit up. For the youngest children, many had only known black-outs and air-raid sirens, and seeing the lights at night actually scared them. My biggest complaint is self-inflicted – I did not follow the advice of the Chief Archivist for DND who recommends in the introduction that people should read a few stories at a time rather than plowing through them. My challenge was simply that I borrowed the book from the library, so with limited time, I did plow through them. And hence probably had a lessened impact than if they were read properly. As a result, I found myself in some places confusing stories with the previous one, thinking “how did she do that? Wasn’t she in Europe by then?” and then paging back to realize it was a different woman with a similar occupation. In others though, I find myself struggling with the format – the stories appear one after another, seemingly ungrouped in any way. I can’t help wondering if there would be more impact if the stories had been arbitrarily grouped to convey a stronger message. For example, by province of origin – would those who were born in Ontario have a different experience than those in Winnipeg? Ordering by service branch would be an obvious option but might negate some of the commonalities across branches. One could organize by a dozen other possibilities too, such as their posting, occupation, age at induction, future careers, whether they went overseas, etc. In the end, the challenge might just be the biographical genre. Given the wealth of information, I found myself wanting to see some analysis across the anthology that you could digest and pull out, rather than just the raw text. But that would be a different text then, perhaps one more for academics to produce. And absent the analysis, I wanted to see different ways of sorting – but that too would be a different publication, more of a database than a book. A great resource somewhat limited by format. Disclosure: I am personal friends with the editor. Esther Breslau is a Jewish immigrant who has found a job working as a photographer in the graft-filled world of 1895 Manhattan. John Tonnerman is an honest cop, a rare commodity on a police-force filled with those on the take and in a city where your innocence depends on the size of your pocketbook. Esther takes a picture during a riot and the thugs notice and come after her. A reporter she has been working with has the plates but the thugs worry about what he knows and take matters into their own hands to silence him forever. John and Esther try to figure it all out. The research was impeccable, and the epilogue is a nice touch to separate fact from fiction. The writing is first-rate and the settings are alive with the time. Each image portrays the world of the time, and the reader is transported easily with each page. A couple of small nit-picky points — there are a a lot of characters, which can be a problem to track in mystery stories, but they are sufficiently different here that they don’t run together as much. A few of the characters (such as the reporter) were fleshed out a little TOO much, but I’m assuming part of that was with a view to them showing up in future stories too. 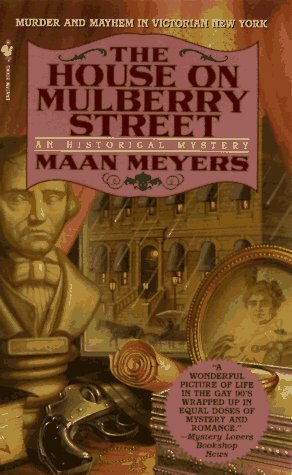 One of the best historical mysteries I have read.